SV Instruments can offer you the entrance to rheology. We have simple solution to your complex rheological requirements. We offer solutions for Car Industry, Teaching, Chocolate, Food Industry, Cosmetics and Pharmacy, Paint Ink and coatings, Chemical and petroleum products and Building materials. We offer Highly sophisticated Fourier transform rheometer which can do your job in seconds which otherwise take hours. Rheology : A Breeze ! The all in one's versatility meets all your needs: restricted sample quantity, products containing charges or aerated products, measurements at high temperatures, high shear rate. SECURITY AND CONFIDENTIALITY: An "operator" function allows you to enter a username for your instrument. This user must then be identified using a 4-digit code. There is also a protected mode that locks your measurement conditions. We recommend placing the LS400 TOUCH on a very stable stand or on an anti-vibration table (optional). BENEFITS FOR YOU: Measure your very-low viscosity products (water-solvents) with a maximum volume of 1ml at low shear rates. The LS400 TOUCH has a large 7" colour touch screen which allows comfortable use and optimal viewing of measurements. Storage of your measuring methods. Data can be backed up and exported using a USB key. Lets you set measuring times for thixotropic products. External control thanks to the optional RHEOMATIC LS software. Get kinematic viscosity by inputting the density of your product. 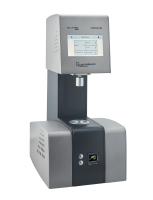 The exciting new MFR 2100 Micro Fourier Rheometer has redefined the state-of-the-art in rheological analysis. This groundbreaking product has revolutionized the traditional rheometer market due to the significant benefits offered by its ability to analyse very small volumes and perform analyses across a wide frequency range in seconds. 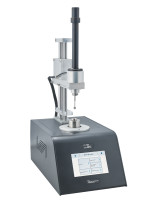 While traditional rheometers use a twisting motion at a single frequency, the MFR 2100 applies a patented pseudo-random squeezing motion to a sample. The complex visco-elastic properties are extracted across a wide frequency range in seconds at high resolution using Fourier analysis. This makes the MFR 2100 excellent for measuring the visco-elastic properties of materials that are changing rapidly with time. An example of this is in the paint industry or in the adhesives industry where the visco-elastic properties of samples that are curing are desirable. Traditional rheometers also require large volumes of sample. The MFR 2100 can perform analyses on volumes to less than 100 µL hence analyses on precious samples can be performed. An example where the MFR 2100 has been used is the analysis of Human Tears. The automated sample introduction system enables sample introduction and subsequent cleaning in seconds. The MFR 2100 has already been used in the analysis of inks, biological fluids, cosmetics, polymers, adhesives, paints, food and petroleum products. 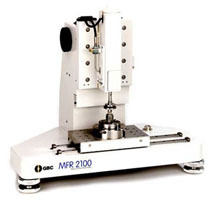 Because of the uniqueness of the MFR 2100 many applications, which have not previously even been thought of using a rheometer, can be performed using the MFR 2100. The powerful Windows® software enables graphical representation of all rheological properties on the same screen. GBC is known worldwide in the elemental and molecular analysis field with its successful range of AAS, HPLC, ICP and UV-Vis products. 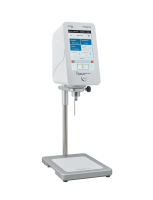 The MFR 2100 has further strengthened its position in the market as it enters into the rheological field with this unique instrument.